This book explores from an English law and Institutional perspective the various types of injunctive relief that are available to a party before and during arbitral proceedings. In particular, this book examines the basis of the power of English Courts to grant such injunctions and explains when such injunctions will be granted. It considers any limitations attached to such injunctions and the relationship between section 44 of the Arbitration Act 1996 and section 37 of the Senior Courts Act 1981. 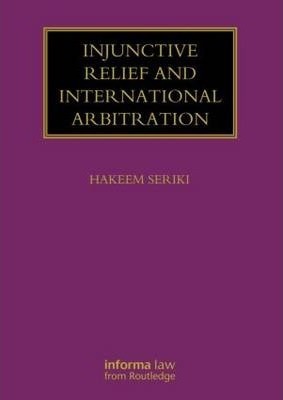 It also provides an in-depth analysis of case law and the emerging trends in this area of arbitration, as well as the powers of arbitrators under the ICC and LCIA Rules to grant such relief and other remedies that might be available to a party seeking to uphold an arbitration agreement. This book will be a vital reference tool for practitioners, arbitrators and postgraduate students. Dr Hakeem Seriki is a senior lecturer in commercial law at the University of East Anglia. He is a consultant to the International Arbitration Group at Steptoe & Johnson and has written extensively on arbitration matters across a number of different journals.